Working in collaboration with Bandai Namco, Romain Jerome channels its playful spirit in the most colourful version of the Pac-Man watch yet. From Space Invaders to Super Mario Bros., Romain Jerome, or RJ, has a long and successful streak translating beloved video games from our childhood into high-end “toys” for the wrist. 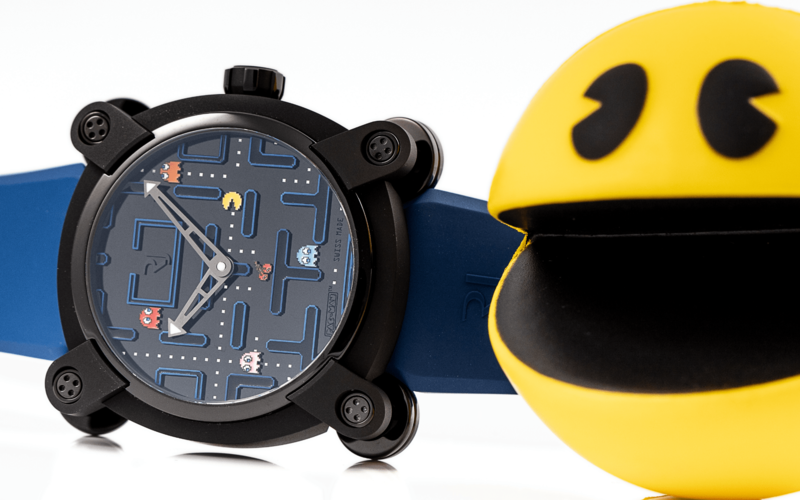 With the new Pac-Man Level III, distributed exclusively in Malaysia by LuxuryConcepts, the quirky watchmaker that is famous for introducing moon dust and volcanic ash into its watches has given the model a whole new look. At the centre of attention, quite literally, are the hand-applied pixelated Pac-Man, ghosts and cherries that have been filled, also by hand, with lacquer in different colours. The maze is made up of raised walls coated with black lacquer for heightened 3D effect. The walls are also adorned with blue aluminium, which are sanded on the edges and polished on top. The parade of colours on the dial is a welcomed change from earlier models that are mostly in black. The dial’s mirror-polished finishing is also a departure from norm, and delivers a cleaner aesthetic with better legibility. In total, the dial consists of 27 different components separated into three levels. The 46mm case is in titanium with black PVD coating. Turn it around and you will discover a black medallion of Pac-Man affixed onto the caseback. Powered by an automatic movement with 42 hours of power reserve, the rubber strap is in blue to match the dial’s aluminium maze walls. Pac-Man Level III is limited to 80 pieces.